100% PCI-DSS compliant Magento hosting with sub-second load times. The best Managed Magento Hosting. We've created the UK's best Magento hosting platform, engineered to deliver the fastest possible speed, security and reliability, all backed by effective 24/7 support from Magento experts. Powered by lightning fast SSD SANs, Magento specific server-side page caching, HTTP/2, a free CDN and much more, our platform is engineered to deliver true sub-second page speeds. Install Magento (and over 400 other apps) in a click. You're also able to backup, upgrade, clone and delete your installations. Existing Magento store? We'll migrate it for you. No hassle, no wasted time and no headaches. If your host is letting you down, we'd love to welcome you. With multiple firewalls, daily malware scanning, automated Magento security patching, full account isolation and free one-click SSL certificates, our Magento hosting delivers the best possible security for your store. We automatically backup your store as often as once per hour depending on your plan, including the ability to take on-the-fly snapshots and self-restore. Enterprise customers can also enjoy high availability with load balanced server clusters and real-time replication. Supercharge Magento further with Redis as an in-memory backend and session cache. Turbo charge your checkout, add to cart and Magento backend. Integrated with CloudFlare's CDN and Railgun optimisation . With over 100 datacenters worldwide, your store will be supercharged for visitors globally. Going the extra mile to help our customers is our passion. Our team of Magento experts are available 24/7 with fast support via chat, ticket or telephone. Our super-charged Magento hosting delivers insane speeds that outperforms other 'so-called' optimised platforms, including HTTP/2 support, the world's most powerful Magento page cache, LiteMage, session and backend caching with Redis and a lightning fast SSD SAN. We guarantee your site will load faster and be capable of handling more visitors than competing platforms, or we'll give you your money back. Benchmarks conducted on identical server hardware using Siege against a default Magento CE 1.9 installation with Magento's sample data, simulating 50 visitors, each accessing 10 catalog and product pages. From acquisition to conversion, a faster web site will help boost your revenue and accelerate your store's growth. 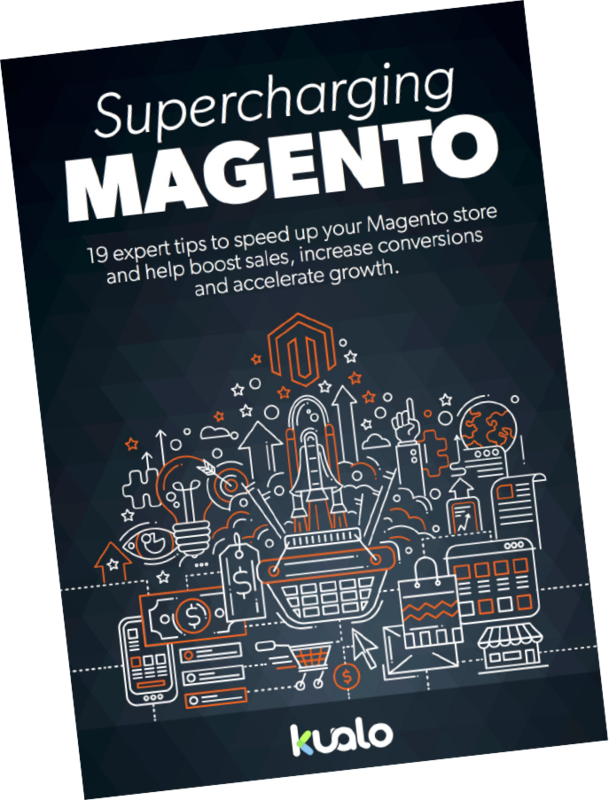 Download our free e-book to discover why speed is so important and how you can optimise your Magento store to achieve sub-second load times. Discover the real-world benefits Amazon and other online giants gained by increasing speed. Quick application-level changes to optimise Magento for fastest speeds. An overview of server-side configurations and caching technologies. Learn how to accelerate the speed of your store globally. Best In Class Magento Security. E-Commerce stores require the best possible security, and our platform delivers. We scan our servers to ensure ongoing PCI compliance and will work with you to help you pass your own PCI compliance scans. We run multiple firewall layers including a Web Application Firewall with Magento-specific rulesets to help protect your store against exploits. Our servers run a caged file system which isolates every user on the server. Security issues in other customer web sites cannot affect your own site. We'll scan your account for malware and we'll notify you and quarantine anything malicious we find. We'll also notify you if your Magento needs an update. Your Magento will be automatically protected with critical security patches. These patches have been back-ported to be 100% compatible with the version of Magento that you have installed, ensuring zero compatibility issues. Our platform is perfect for Magento stores of any size. From single stores on our shared infrastructure, to large stores on private servers or enterprise clusters - we've got you covered. Looking to host a single Magento store? Or want to test us out for a bigger project? Our Startup plan is a low cost way to host your Magento store on our super-charged Magento stack. Your site will fly with LiteMage, the fatest server-side page cache for Magento, and Redis to turbo charge your add to cart, checkout and backend - all housed on state of the art enterprise servers featuring hardware auto-failover and fully redundant SSD block storage. Plus many more awesome features! ...or prepay and get up to 1 year free! Whether you're hosting a single large Magento store, or multiple smaller stores, the Professional plan provides complete flexibility. You can use Magento's multi-store facility, or run multiple diverse Magento installations all on different domain names. Want to run a WordPress or WooCommerce site too? No problem. We've got you covered. And with double the RAM of the Startup plan and additional processing power, you'll be able to handle even more visitors with super snappy speeds. And for the cherry on top - we also take backups twice daily for extra peace of mind. With oodles of disk space, double the RAM of our Professional plan along with even more processing power, our Business plan is the ideal solution for busy Magento stores or those with a large number of SKUs. With double the number of sites you can host, you're able to run more front-end stores or even other applications, such as WordPress blogs. Business plan customers are backed up every 4 hours, giving you have a huge number of recent recovery points should the worst happen. For big brands and growing stores, our Premium plan is hosted on your own private server, tuned and configured to your requirements. Backups are taken hourly or at the interval of your choosing. The entire environment can be fully branded, and you're able to setup independent access to each site's control panel, making it the perfect choice for Magento developers and agencies. Our Enterprise plan delivers the ultimate in scalability, security and reliability. With multiple servers configured with load balancing and real-time data replication, your store will be highly available and capable of handling millions of visitors. Backed by an enterprise 100% uptime SLA, this is the choice for enterprise stores that require zero downtime. We're so confident that you'll love our service that we offer a no quibbles 60-Day Money Back Guarantee on all our plans. If you have an existing Magento store, we'll migrate it free of charge from your existing host. No hassle, no worries. Every plan is backed by a dedicated team of Magento experts who work 24/7, ready to assist you should you get stuck. Get a detailed overview of the differences between our plans. Our Magento hosting plans all come with the following awesome features! 100% In-House Team - No Outsourcing! Can I only host Magento sites on these plans? These plans are specifically engineered for Magento, however you can also host other PHP applications or HTML based sites as well. We have over 300 web applications available to install in a click. LiteSpeed cache, Redis & Memcached can be used on any applications that support them (notably WordPress supports all three). Can I host multiple web sites/stores? Yes, each plan includes the ability to host more than one store or web site. This allows you to run either separate Magento installations, run a single multi-store Magento installations with sites on different domain names, or even run different applications such as a WordPress blog on a different domain to your Magento store. Upgrading between the Startup, Professional and Business plans is automatic and you would just pay the difference between the two plans. If your store is ready to move onto our Premium or Enterprise platform, we will need to migrate your site to it's own private server infrastructure. Our team will manage this for you and the specifics of this can be discussed during the consultancy phase. What is the price for your Premium & Enterprise plans? It's not possible for us to list 'set' pricing for these plans as they are capable of scaling from any size - we can fully customise the number of cores, disk space and memory available. With Enterprise plans, your store will run on multiple servers, and the quantity of servers will again depend on your exact requirements. One thing is certain though - our solution will be significantly cheaper than Magento's Enterprise edition. We accept Visa, MasterCard, American Express and PayPal. Premium & Enterprise customers can also pay by bank transfer. Yes, we offer a full 60-day money back guarantee on all plans. Premium & Enterprise plans require extensive setup, which will incur a setup charge. This charge is non-refundable, so if you are unsure about the benefits of our platform, we would recommend first trialling one of the smaller plans. We will migrate your existing store for free with any plan, and help you get set up with all of the caching tools. To do this we will need access to your existing hosting service. You will be able to fully test the site on our platform prior to making the site live for your visitors. We provide a 99.9% uptime guarantee on our Startup, Professional, Business & Premium plans, and a 100% Uptime Guarantee on our Enterprise plan. Will you keep my Magento up-to-date? Our role is managing the platform itself, you or your web developer will still need to upgrade and maintain your Magento installation. Our web application installer does include a one-click upgrade system for Magento core, but it is ultimately up to you to process these upgrades and also ensure that any updates to your installed themes and extensions are also processed. For Magento 1.9, it is also possible to turn on 'Auto-Upgrades'. All our plans include the ability to backup your individual application installations, as well as take on-demand snapshots of your entire account. We would always recommend that you create a backup of your Magento store immediately prior to making any critical upgrades or changes in Magento. We back up your files and database according to the frequency outlined in the plan table above. You will be able to restore your files, databases or your entire account yourself at any time via the control panel. You can also take a snapshot of your account at any time. If you'd like our staff to help you with the restore, we can do so at no cost. Our backups are extremely reliable however we always recommend that you keep your own backups periodically, as we can't accept liability in the unlikely event a backup doesn't run or contains errors. You may generate a downloadable backup of your account at any time via the control panel, and you can optionally add CodeGuard Backups for additional peace of mind. We will retain 30 days worth of file backups, with those backups being taken at the interval outlined, and every shapshot retained. For plans with higher frequency backups than once per day, we store 5 days worth of high frequency database backups, and one daily database backup for 30 days. For example, on the Business plan we will be backing up your files and databases every four hours. After 30 days, you will have 180 file snapshots (30 days worth) and 55 MySQL snapshots (30 daily backups + 5 days of 4 hour backups). How does the LiteMage caching work? To enable the close integration between Magento and the web server, an extension needs to be installed into your Magento store. This extension takes care of every aspect of cache clearing (for instance if you change product pricing). It has full ESI 'hole punching' support, and also features a public and private cache, so your site will be fast for both logged out and logged in users. Can you help me configure LiteMage & Redis for me? We provide full documentation on how to implement all of the caching for both Magento 1 and 2. If you get stuck, we will assist with configration for free for up to one store per account. If you are hosting more than one store, we can help but we would charge a small fee to cover the time taken. Our Premium & Enterprise plans are tailor made to meet your exact specifications. Please complete this form and one of our Magento experts will get in touch to assess your requirements and outline how we can help.